Sunshine Coast caravan parks are a family friendly and affordable accommodation option surrounded by the stunning hinterland and coastline of the region. Boasting views of the Mary Valley, Glass House Mountains, Blackall Range and Noosa Hinterland, Sunshine Coast caravan parks offer everything from campsites and caravan sites to self-contained cabins. There are a number of Sunshine Coast caravan parks located in Forest Glen, Noosa, Maroochydore and Coolum, all conveniently located close to a range of local shopping, dining and tourist attractions. BIG4 Forest Glen Resort: Located just a short drive west of Maroochydore, this caravan park offers 48 acres of parklands to relax and enjoy the facilities. Prices range from $39 to $299 per night. Boreen Point Campground: Situated on the shores of scenic Lake Cootharaba, the area is a popular destination for recreational activities. Prices range from $22 to $31 per night. 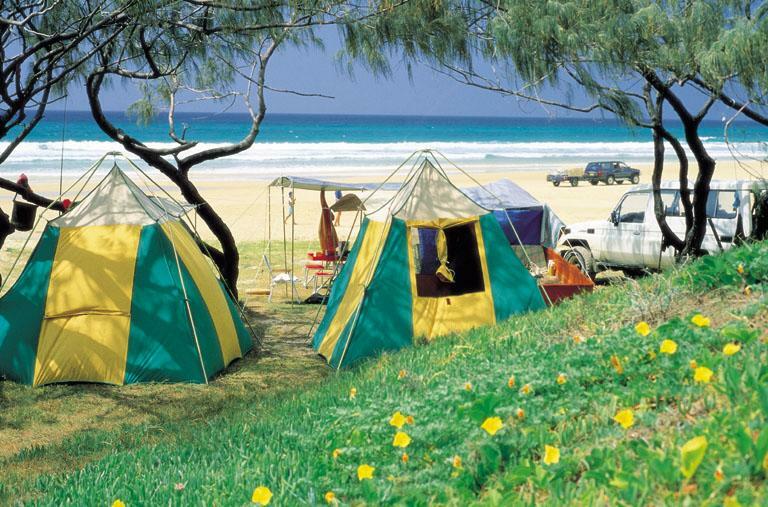 Coolum Beach Holiday Park: Set on 4 hectares of beachfront land, this is one of the most popular camping and caravan parks on the Sunshine Coast. Prices range from $37 to $231 per night. Cotton Tree Holiday Park: A popular family haven, this holiday park is set on the banks of the Maroochy River making it a water sport hot spot. Prices range from $37 to $231 per night. Dicky Beach Family Holiday Park: Located in the southern Sunshine Coast, this holiday park enjoys a prime beachfront location in Caloundra. Prices range from $37 to $140 per night. Landsborough Pines Caravan Park: The place to be for easy access to all the attractions of the Sunshine Coast in a convenient, central location. Prices range from $35 to $135 per night. Lilyponds Holiday Park: A comfortable, convenient and affordable hinterland accommodation option close to shopping, dining and attractions. Prices range from $30 to $150 per night. 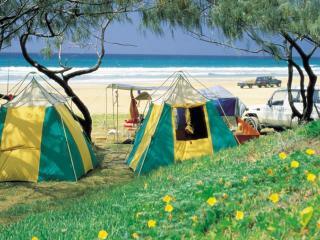 Mapleton Cabins & Caravan Park: Enjoy cosy self-contained cabins or caravan and camping sites in the scenic hinterland. Prices range from $75 to $110 per night. Maroochydore Beach Holiday Park: Located right next to the Tourist Information Centre, this holiday park enjoys 1.6 hectares of beachfront land. Prices range from $41 to $231 per night. Mooloolaba Beach Holiday Park: Enjoying an absolute beachfront location this holiday park fronts one of Queensland's safest surf beach. Prices range from $41 to $68 per night.